Heavy gunfire near Gambia's presidential palace has been reported by residents of the small West African nation, according to the Associated Press news agency. According to the report, Gambia's longtime ruler Yahya Jammeh is out of the country on a visit to France. According to Aljazeera, Witnesses who spoke to AP on condition of anonymity for fear of reprisals said that soldiers linked to the presidential guard were involved, raising the spectre of a mutiny. According to AP, there was a total blackout at Gambia's state radio and television and the deputy of the National Intelligence Agency, Louis Gomez, refused to comment on the reports of a possible coup attempt. Gambia is a tiny former British colony surrounded by Senegal on both its northern and southern borders. 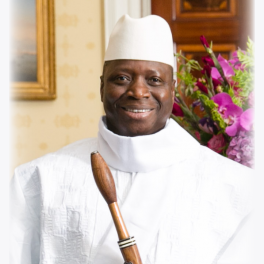 Human rights activists say Jammeh's regime is repressive and has targeted political dissidents, journalists, and gays and lesbians. He first took power at the age of 29 after a 1994 coup.